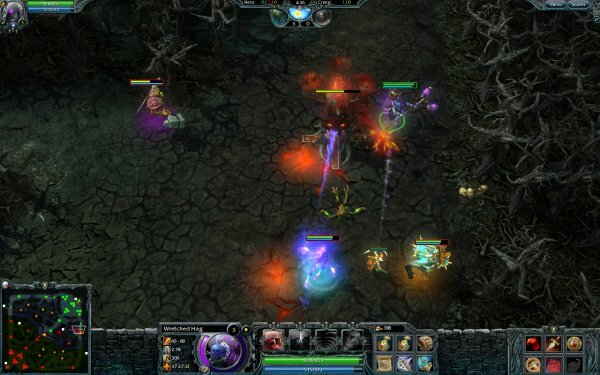 Heroes of Newerth - Charge! Linux games are many and varied. You can find pretty much anything you need, from simple arcades via racing all the way to expansive and elaborate tactical shooters. Still, one aspect of the Linux gaming scene is underplayed, this being the Real Time Strategy (RTS). For whatever reason, there's a lack of great strategy games for Linux. You will find some, but not as many as you would hope for. However, that is about to change. 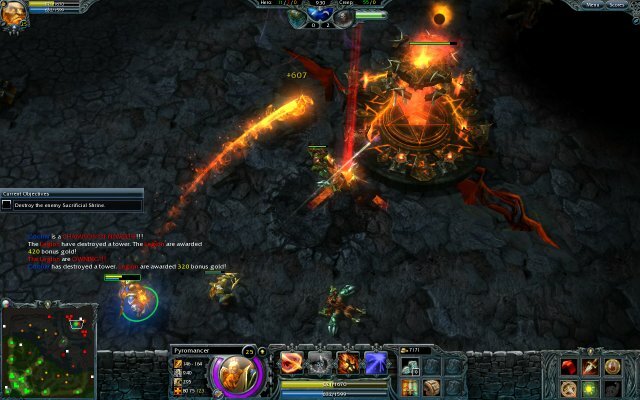 The magic words: Heroes of Newerth. 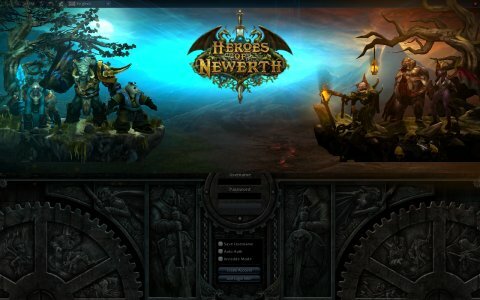 Heroes of Newerth (HoN) is a game created by S2 Games, the company behind Savage and Savage 2 shooters. Since I really liked the previous titles, I was really pleased when the open beta was released about two months ago. I promptly downloaded the game and started exploring. 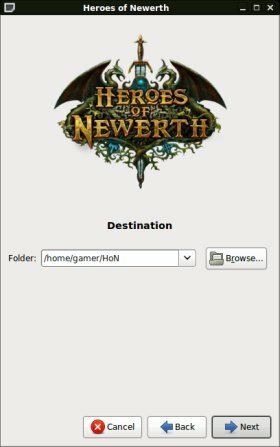 I tried HoN on my RD510 laptop, which has an Nvidia 9600GS card and runs a dedicated gaming instance of Ubuntu 9.04 Jaunty. The installation went smoothly, without any problems. The game neatly extracts into its own directory, although you can choose any location you want. Fired up, HoN has the same posh look like the other two games, a promise of good things to come. The first time I logged in, the game underwent a small update and restarted without any problems. I was off to have some fun. You can take a short, 20-min tutorial and get acquainted with the game basics. I think you should do this, since the focus of HoN is different from Savage, although there are some similarities in the gameplay. Most importantly, instead of fighting in a first-person view, you dominate an isometric view of the terrain. But the idea of conquest remains, with fresh elements that add a whole new dimension of excitement and strategic complexity; friendly bots, a gold-based system of logistics support for your faction and defensive structures, to name a few. I tried the tutorial first and really liked what I saw. The one thing that popped into my mind was that the HoN reminded me of Warcraft III. Afterwards, when I read online about HoN, I was not really surprised that it is indeed based on the said game. 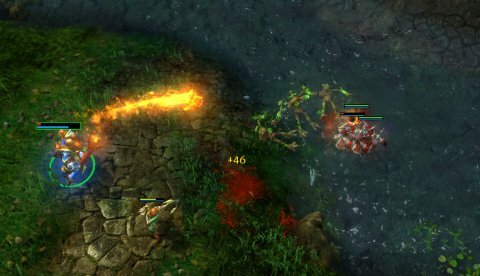 HoN is pretty much Warcraft III, without the economic element, focusing on fighting against enemy heroes. The heart of the game is to defeat the enemy, plain and simple. There are two factions available, the Legion and the Hellbourne. You control a hero, one of many available, blessed with unique qualities, skills and spells. The goal is to gently rush forward and bludgeon the opposing heroes to death, while using style, cunning and magic to your advantage. Dissimilar combat is what makes HoN so much fun. Each hero has its own strong sides and its weaknesses. For instance, intelligent units will avoid engaging agility units directly, because they have an obvious strength and stamina disadvantage. But they have much better spells and can attack from a distance. The precarious tradeoff is what makes HoN unpredictable and fun beyond mere statistics. On top of that, you get constantly respawning hordes of bot units, called creeps, which fight on your side, helping you. These include all kinds of cheap, expendable infantry units and some artillery, created with the sole purpose of dying. As a hero, you can use them to bait the enemy troops, soften enemy positions or as a shield against superior numbers. The creeps will respawn periodically and rush down predetermined paths called the Lanes, where they will engage any enemy unit that comes into range. The bots are an important element of the game, adding color and chaos, as well as helping you, especially after you fall in battle and respawn, since you will need a few moments regaining strength. Their kills will also count in your favor, earning you gold. 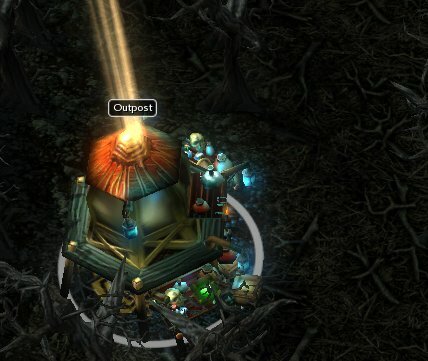 Another critical aspect of the game is the ability to buy items in various gypsy-style shops dispersed about the map, called the Secret Store and the Outpost. These items cost gold, so choose wisely. In return, you get spells, charms, healing potions, mana, and recipes, which can be mixed into powerful blended spells that wreck havoc on the opponent. Furthermore, your spawn point is a well of health and rejuvenation, allowing you to quickly tank up your life and mana points as well as purchase items and spells you need. The battle ends once you destroy the enemy spawn. The Legion have the Tree of Life and the Hellbourne have the Sacrificial Pit. To get there, though, you will first have to knock down a number of powerful sentry towers and destroy the barracks that spawn the bots. Not an easy task and will take a long time to achieve, especially if the enemy hero plays well. Oh, the pentagram element, while stylish in fiery decoration, is definitely a cliche for being associated with the Hellbourne units. After all, it's nothing more than a symbols of the five Earthly elements in the peace-loving Wiccan lore. Well, no matter. Heroes gain points by defeating enemy troops. You gain levels, which in turn allow you to upgrade your spells, becoming even stronger. You can also engage neutral enemy units on the map, building up your experience before you head into real combat. Again, this is very similar to Warcraft III. Online gaming is what HoN is all about. After you complete the tutorial, you should join one of the many game servers running. Some are geared toward experienced users, others cater specially for newbies. 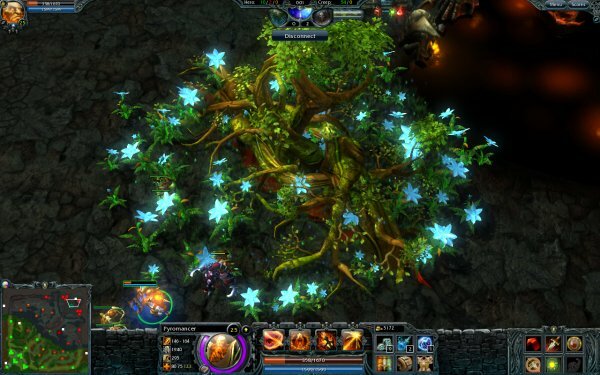 HoN is a very popular game, with thousands of players online. Even during my testing, while the game was still in a beta stage, the servers were crowded with people. The multiplayer was also great fun, although a little confusing at first. After you choose the server and join in, you have to choose your faction. The games do not start instantly, so you spend some time chatting with fellow players and waiting for others to join in. After that comes the hero selection and you're in. The game played well, without any problems or glitches. I was alone against four seasoned players, so the battle unraveled with rather unfavorable odds. I tried my best, but was eventually GNUkakke-ed by my foes. There are sixty heroes available - more coming - with a countless number of individual skills and attributes, roughly categorized in three major groups: strength, intelligence and agility. This defining characteristic shapes the growth of your hero in the long run, with some having an advantage in the first moments of battle and others getting stronger in the later stages. Using your hero wisely and keeping it away from certain-death traps is a key element to success. While you can respawn any time you die, you lose time and money, more so with each level gained. Die while just a fledgling hero and your penalty is small. Die as a mighty paladin and you will wait several minutes before you can fight again, all the while watching helpless as enemies tear apart your stronghold and annihilate your bots. Avoid fighting when outnumbered, keep the spells for critical moments in a duel and let your bots do the hard work. Retreating is always a wise choice when facing overwhelming odds. Make sure your hero is used in the best fashion that suits its special abilities. 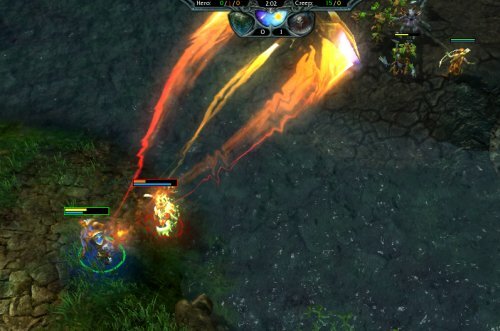 You can play HoN as nothing more than a point-and-click kill machine, but it's all about strategy, and more than you think. Furthermore, there's a strong social focus in the game. You have a lobby chat, a stats system, a ladder ranking system, and even a built-in VoIP that allows you to communicate with fellow gamers. There's also emphasis on the quality of service, with features that allow users to rejoin a match if they suddenly get disconnected, get punished if they are in a habit of leaving the match too early, an anti-lag mechanism, as well as matchmaking players with similar skills to avoid noob-bashing, although this did not work for me. All in all, HoN seems like a very smart choice. Oh, I have always complained that Linux lacked proper RTS titles. While the FPS arena is saturated with excellent games, there are few really strategy games that can match the most popular Windows counterparts. There's Wesnoth, UFO Alien Invasion, OpenTTD, the not-easy-to-setup Spring family, and maybe a few others. Well, Heroes of Newerth balances the equation. The game is well made, carefully designed, rich, and complete. 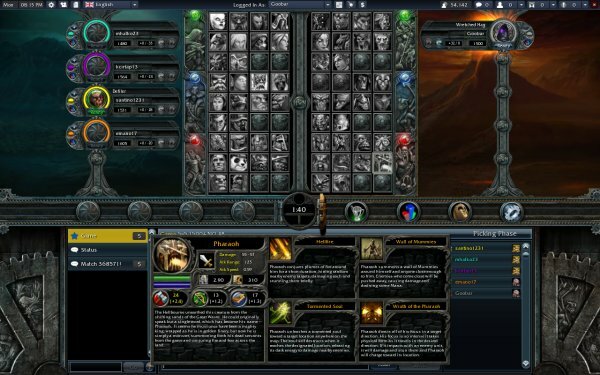 While it runs on Windows and Mac, too, it does not diminish the fact Linux users can also enjoy a first-class strategy game. 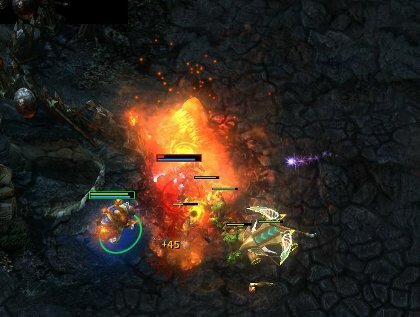 HoN costs USD30, but this should not stop you from trying the game or buying it afterwards. I believe the game is a smart, pleasant investment and a refreshing addition to the Linux gaming repertoire.